You can hop in a water taxi and whizz across to the Pakleni Islands, a necklace of craggy atolls off the southwest coast of Hvar, in no time at all. And you’ll have a fine old time of it, walking across the wooded islets and watching your kids splash about in the shallow lagoons and sheltered bays. But hop in a kayak and paddle along their rocky coastlines under your own steam, and the whole experience just somehow feels more satisfying – the water seems clearer, the beaches more picturesque. And stopping off along the way to snorkel in little coves far removed from the water-taxi routes only adds to the experience of it all. Marinkovac, the nearest island of any significant size, looms large just a few hundred yards across the water as we haul our kayaks down the pebbly shore of Bonj Beach. Yet we fancy ourselves as swashbuckling adventurers about to embark on a mini expedition, our “supplies” of suntan lotion and snorkel masks stowed carefully onboard. It’s an easy paddle to get out of the little bay – which is a good job, as our initial strokes are a flurry of incoordination, our paddles spinning like drunken windmills as we both try to go one way whilst Maisie and Joe do their best to go the other. Several minutes of free entertainment for the onlookers on the beach later, something clicks and we’re all suddenly steaming out into the Adriatic, our blades slicing the sea in new-found unison. We wait, enjoying the well-earned rest as a local passenger ferry chugs along the channel on its way into Hvar Town, before striking out again for Marinkovac. The course we’d plotted on our map from Kayak & SUP Hvar takes us along Marinkovac’s west coast before looping around the island of Borovac and back to base. The beach at Ždrilca is a popular stop with the kids, partly for the shrimp pasta at Mamato restaurant and partly for the lagoon-like Mlini, arguably the most beautiful bay in the Pakleni Islands, that lies a five-minute walk away. It’s a hard place to leave, but more secluded coves are waiting. And they’re not going to snorkel themselves. 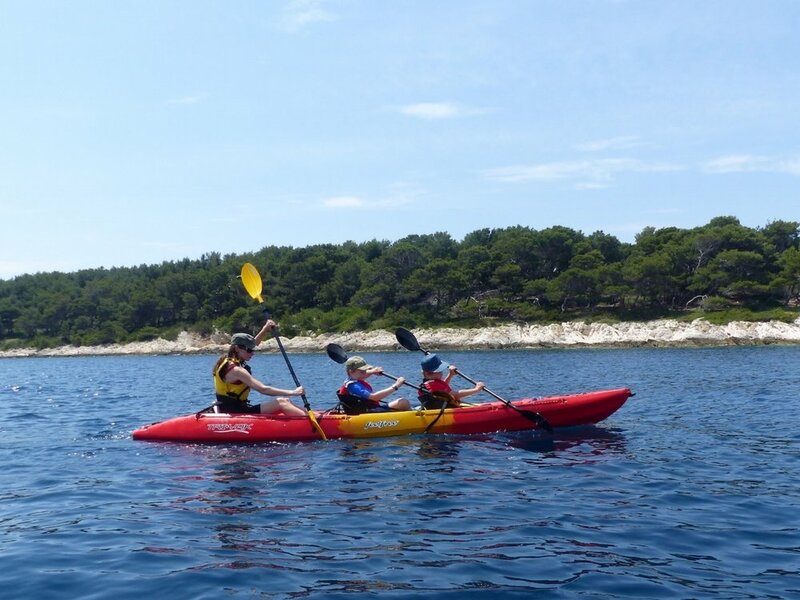 Kayak & SUP Hvar rent single and tandem sit-on-top kayaks (from 100kn per hour, including life jackets, dry bags, snorkels and map) from a cabin on Bonj Beach, a ten-minute walk along the seafront from Hvar Town. They’re easy to use and ideal for kids (and novice adults!). Family-friendly places on Hvar include Cottage Calleis and Villa Rosa, near Stari Grad, and Villa Hera, near Hvar Town.